With a particular focus on the passenger terminals, the Zoeftig name has over the years become synonymous with innovation and the highest possible quality standards. Our ground-breaking and pioneering airport furniture and terminal seating can be found across the globe in some of the busiest airports. 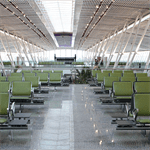 When it comes to airport furniture and terminal seating, Zoeftig’s capability is proven over many years. Today, we remain right at the very forefront of developments in the industry and are renowned for our creative and design-led approach. Whether through an ongoing commitment to rigorous research, the development of new design process methodologies or constant collaboration with architects, interior designers, suppliers and passengers, rest assured Zoeftig is doing it's very utmost to push back the design frontiers and underline its position as the number one name for airport furniture and terminal seating. From the amazingly comfortable Infinite airport chair to the Zenky & Zenky Plus - Zoeftig provides seating that, truly, never stands still. You’ll find us in many of the world’s great gateways, with our renowned furniture and terminal seating systems gracing more than 200+ airports worldwide. From Mumbai to Manchester, from Dubai to Domodedovo, from Miami to Melbourne, from Heathrow to Hong Kong, from Kuwait to Kumming. 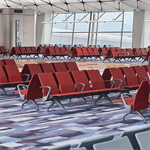 Zoeftig boasts a comprehensive range of seating solutions including airport furniture, beam seating, terminal seating and waiting area seats. Whether it’s a traditional row or a sociable airport chair cluster, seating designed to offer privacy and convenience to the business traveller or VIP lounge seating with a little more space and luxury in mind, rest easy in the knowledge that Zoeftig has a beautifully designed and flexible seating solution to suit. You can view all our case studies here. With design and innovation central to the Zoeftig business vision, you can trust our experienced design team to tailor precisely the right airport furniture and terminal seating system to meet your most specific needs. Working closely with airport planning, operations personnel and architects and designers, we will configure a solution to any specification, for any budget – to create the ideal waiting area experience. In fact, time and time again, where no existing product will suffice, Zoeftig has gone above and beyond to develop the technology and conceive an entirely new seating solution. An innovative custom-built special that’s designed to match the client’s most precise requirements. Whether you’re getting a standard solution from Zoeftig or something completely bespoke, the end result is always the same. Airport furniture and terminal seating stylish and comfortable enough to create a welcoming and inviting environment for passengers, but also robust and durable enough to withstand the rigours of daily use by many thousands of travellers. 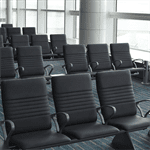 For more information, you can view our full range of airport furniture and terminal seating here. Alternatively, you can use the online enquiry form and we’ll be happy to help you further.